Home » Investing » Commodities » Hard Commodities » Oil » Are Oil Refiners Due for a Correction? Are Oil Refiners Due for a Correction? Fresh money is flowing into crude oil and energy exchange-traded funds (ETFs). That’s encouraging for crude oil bulls. Although oil shares are going up, prices look stretched. I’d rather not join the bandwagon now. Nor do I want to step in front of that bus just yet. I’m waiting for signs that crude oil’s upside momentum has stalled. Then I’ll consider strategies to profit from a correction. Until then, my focus is on gasoline. Talk about stretched. You can go back more than 10 years and not find a time when speculators were as bullish on gasoline futures as they are today. That’s just one reason oil refining companies are begging for a correction. The chart above shows the VanEck Vectors Oil Refiners ETF (NYSE: CRAK). It tracks an index of 26 of the world’s largest oil refining companies. The chart goes back to late 2015 when the ETF was launched. The crack spread measures the difference between the prices of gasoline and crude oil. When the spread is low, refining companies’ profit margins are narrow. Turns out, 2015 was the perfect time to launch an oil refiners ETF. The crack spread turned up, refinery margins widened. It’s been happy days for refining companies ever since. Dark Days Ahead for Oil Refiners? The extreme bullishness of gasoline speculators is reason to pause. Plus, the fourth quarter is the worst time of year for gasoline prices. Whatever you do, be sure to tighten up your energy exposure in the months ahead. 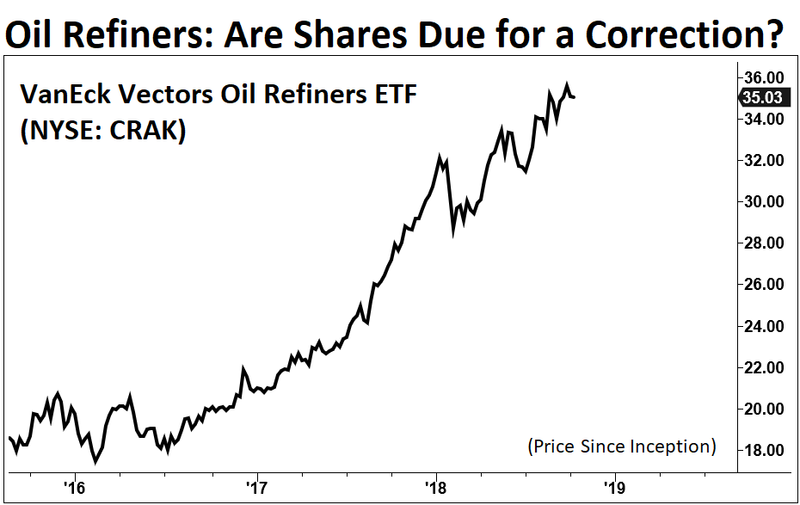 If you’re looking for a way to profit from a playable correction in refiners, you won’t find an inverse refiners ETF anywhere. So, consider buying put options on shares of a refining company like Marathon Petroleum Corp. (NYSE: MPC), Valero Energy Corp. (NYSE: VLO) or Phillips 66 (NYSE: PSX). Put options can earn big returns for a short-term bet that a stock will fall. Next »Don’t Miss out on the Industrial Stock Boom!